Healing abutment with two prep abutments. Whether you have a single irreparable tooth or have lost several teeth to dental disease over time, dental implants can be a great restorative option. The treatment not only improves the cosmetics of the smile but also returns full functionality to your bite. Dental implants are a fundamental part of Dr. Gocke’s practice, and he uses the technique to replace single teeth, multiple teeth, and full dental arches. As a board-certified oral and maxillofacial specialist, he provides high-quality treatment and care to Northern Virginia patients who want durable, natural-looking dental restoration. Why Dental Implants and Why Our Practice? Improving the appearance of your smile. Dental implants look and work like your own natural teeth. A lengthy lifespan. Dental implants usually last for decades when placed by a skilled oral surgeon like Dr. Gocke. Preventing bone loss. When you lose a tooth, the bone that was holding the tooth in place starts to erode, weakening the site and creating aesthetic problems. Restoring the tooth with a dental implant helps to conserve this bone. Supporting the jaw and the soft tissue of the mouth. Avoiding TMJ disorders and symptoms such as pain while chewing. Protecting healthy teeth. When you are missing a tooth, your other teeth have to work harder when you chew. Restoring what you have lost keeps these other teeth from being worn down faster. The dental implants that Dr. Gocke places integrate with the surrounding jaw bone in the months that follow the procedure. Once the implant has integrated, the patient visits their restorative dentist, who fabricates a custom made crown. Because of this process, communication between caregivers is extremely important. Dr. Gocke collaborates closely with referring dentists to ensure that Northern Virginia patients have more durable and attractive outcomes. Additionally, Dr. Gocke has invested in the latest technologies and highest-quality materials for his patients. This allows him to diagnose and plan procedures more precisely and to use more reliable devices, including dental implants from Zimmer Biomet, one the best-known implant manufacturers in the world. Coupled with his extensive training and experience, he and his staff are able to provide patients with predictable and effective results. When you come in for your initial visit, our staff will welcome you, invite you back to a treatment room, and discuss the reasons for your appointment. When Northern Virginia patients are good candidates for dental implants, we will review their medical history and take a CT scan of the area. The information from this scan helps Dr. Gocke plan treatment more accurately and effectively. 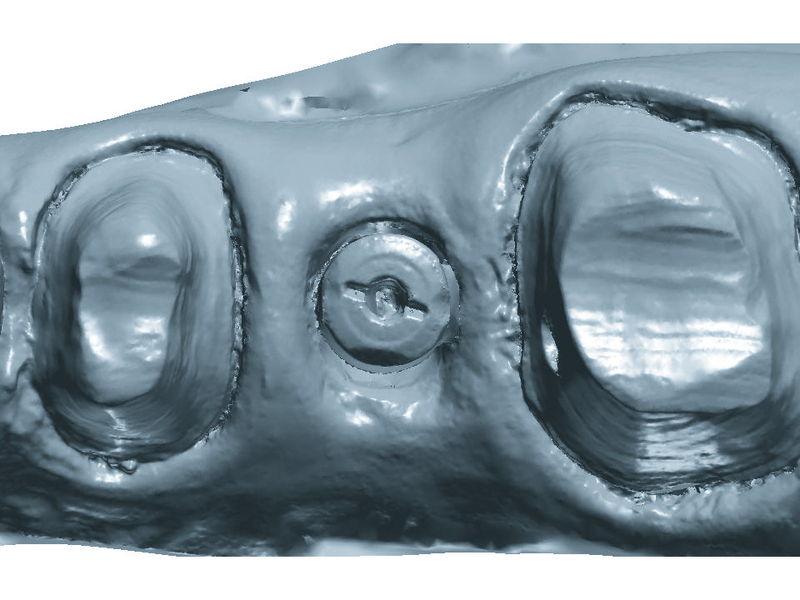 A scan of a healing abutment. After Dr. Gocke reviews your information, he will conduct an examination and talk with you about your goals with treatment. This may include cosmetics, resolving pain or discomfort, or helping you chew food more naturally. Dr. Gocke will then review treatment options and recommend the approach he thinks will best address your needs. As an oral and maxillofacial surgeon, Dr. Gocke can provide several different anesthetic choices to keep you comfortable and relaxed during procedures. Most Northern Virginia patients who are receiving dental implants can have treatment with local anesthesia alone, though he also offers IV sedation and recommends that approach for more complex cases. Dr. Gocke and our staff prioritize the safety and comfort of our Northern Virginia patients. On the day of your procedure, feel free to wrap up in a warm blanket and watch complementary Netflix® on a private screen while we work. During your procedure, Dr. Gocke may extract teeth that are damaged or diseased. He may add bone material or gum tissue to build up the site of a lost tooth so that it can support an implant. If you require an implant to replace a front tooth, Dr. Gocke can have a customized temporary crown made to give you a complete and natural-looking smile. After your procedure, our staff will guide you to a private room, and you will be able to go home when you are ready. Avoid chewing on your dental implants for 3-4 months. If you do use them to chew, only eat soft foods. Keep the dental implants clean, but only brush the top surface at first. The stitches that Dr. Gocke places will fall out on their own. At that point, you can use a regular, non-electric toothbrush for your teeth, which our office can provide. Dr. Gocke sees his Northern Virginia patients a week after their procedure. Most dental implants need about three months to heal, at which point patients return for a second follow-up appointment. Once Dr. Gocke determines that the implants are ready, he will refer you back to your dentist, who will attach the final crowns and complete the treatment. What a typical dental implant journey is like. Your implant options if you are missing one, a couple, or all your teeth. The lifelong emotional and physical benefits of dental implants. Need to pay your bill? Access our secure online portal right from our website. Worried You Can’t Afford It? Make payments as low as $99 a month when you sign up with CareCredit. Restore the aesthetics of your smile and the function of your teeth with dental implants. Contact Dr. Gocke at (703) 388-2805 or online to schedule a consultation in Northern Virginia.